Visual design is an act of problem solving. You have a message to communicate and you seek to find a visual way to express this message. During the design process, you create graphics and text and organize them on the screen in the most effective way you can. and to support principle-based (non-routine task) performance. and features of the graphic itself. In their article, “More Than Just Eye Candy: Graphics for e-Learning: Part 2 of 2 parts“, Ruth Clark and Chopeta Lyons present a design model that incorporates the findings of research and focuses on a systematic process of developing graphics. Defining the visual context requires determining the audience, the physical surroundings in which the e-Learning will be used, and the delivery platform considerations. and the layout of each screen to best support the instruction. In this phase of our design model, you evaluate your content to determine individual graphics that will illustrate key instructional points. You plan graphics best suited to help learners acquire five content types: procedures, concepts, facts, processes and principles. 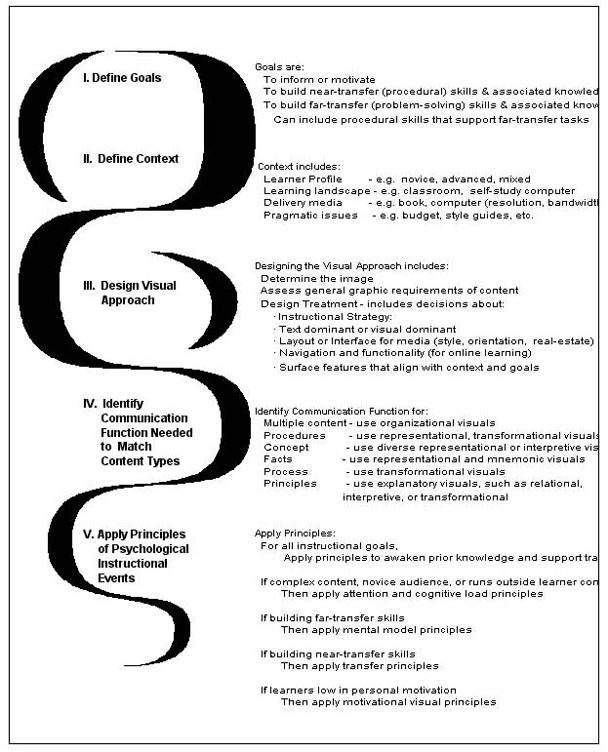 Assess your graphic to make sure it supports the six key instructional events of learning. These include ways to use graphics and graphic treatments to help learners: focus attention, activate prior knowledge in memory, minimize cognitive load, build new mental models, maximize transfer of learning and support motivation in ways that do not disrupt learning.